At Cityskin we use dermal fillers to treat the tear trough and reduce the appearance of under eye bags. The tear trough is something that appears under the eyes as we age. Some people naturally have a slight tear trough so we don’t always correct this area. In the diagram below you can see the anatomical position of the tear trough. Notice that some people have a tear trough at a young age and it is normal! Reducing the tear trough can help you look fresher and less tired. 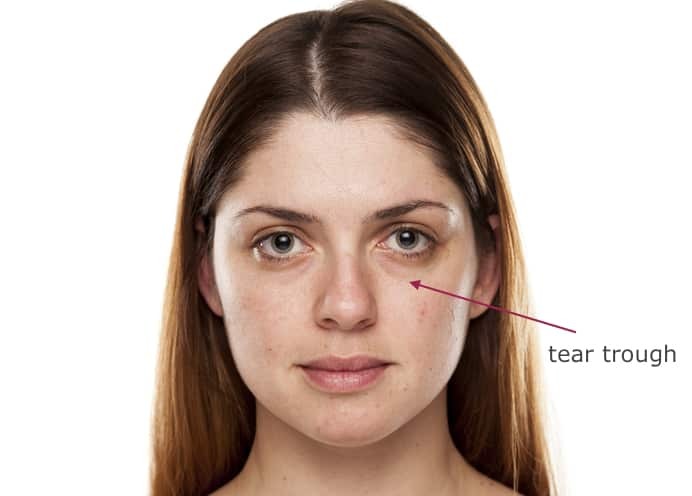 Why do we form a tear troughs / under eye bags? As we age the skull changes. The eye socket becomes larger and the cheekbones reduce in size which means there is less cushioning around the eyes. We also lose fat in the face as we age shown in the diagram below. The fat pads in the face give volume and support and with gradual loss of support the tear trough can become more prominent. Sometimes the trough forms because of loss of volume in the fat pads of the cheeks. 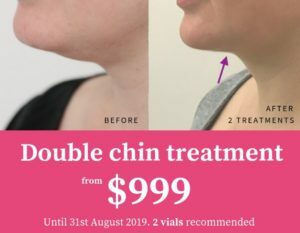 If this is the case then treating the upper cheek with dermal filler can often provide good support to the under eye area and reduce the appearance of the tear trough. If you have good cheek volume and simply have a deep tear trough then dermal filler can be injected into the tear trough to lift the area and reduce the depth of the line. The downside of this method is a slightly higher bruising risk. What are the risks of tear trough treatments with dermal filler? The area around the eyes is one of the most difficult areas to treat. It is an area which is prone to water retention and puffiness so we have to be careful not to place too much dermal filler in this area. Bruising is quite likely around the eyes. At Cityskin we charge from for 1ml of dermal filler, depending on the brand used. Have a read of our cost page for a full breakdown of dermal filler costs. When treating cheek volume we tend to use 1.0ml to 2.0 + mls of dermal filler. Injecting directly into the tear trough itself needs approximately 1.0ml of dermal filler. The patient below has had their tear trough treated with dermal fillers. Small amounts of filler has been placed in the mid cheek and directly into the tear trough to reduce the appearance of dark lines and tiredness. How long does tear trough filler last? Tear trough filler lasts for up to 9 months depending on the type of filler used. The under eye area is delicate and we have to be conservative with the amounts of filler that we can use. Can dermal filler in the tear trough correct dark skin under the eyes? Depending on the cause of the darkness under the eyes, it can lessen the visual appearance of dark circles. When we age, we lose bone, fat pad and muscle. The fat pads start shrinking in size and declining down the face, the muscle weakens and bone structures change from bone reabsorption. The malar fat pad under the eye starts to descend down the face, showing separation of the obicualris retaining ligament. This ligament is what separates the lid-cheek junction. If there is a visable deficit (dark circle) from bone reabsorption and separation of the fat pads, adding dermal filler to replace lost volume will definitely lessen the appearance of dark circles. Other reasons for dark circles include pigmentation and visible vascular structures, as the skin around the eyes is the thinnest skin on the entire body. Dermal filler will not help with the appearance, if these are the cause. Other means of treatment may be laser treatments such as IPL and skin needling.